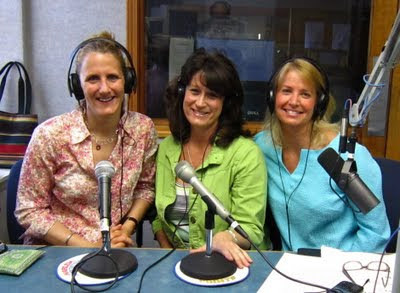 This past weekend I took a break from regular life and drove to pretty Seneca Lake, New York to join Marci Lubore Calantonio on our good friend Cindy's weekly radio show Hope, Health and Healing. The topic? The healing benefits of friendship. Not being a seasoned public speaker it was definitely in the realm of "do what you are afraid to do" for me. I was a guest on Cindy's show for Lines of Beauty last fall but it was via the phone from the comfort of my home. Airing live from the radio station was a little different! It went fine though as things almost always do that I fear. Friendships help to take the weight of the world off our shoulders. Sharing with a friend about life helps to offload stress immensely. Mountains become molehills when you have the support of a friend. A sign of a healthy friendship is one in which you can be yourselves and want the very best for each other. Friends become even more important to have the older we become. As other things fall to the wayside in life the love and support of friends helps to keep us happy, connected to the world, and healthy. Marci explained that we all have 3 big needs- to be accepted, to be approved of, and to be appreciated. True friendships help to fill these needs in one another. They give us validation. The spark for friendship is always there no matter how old we are. One of the things that I admire most about my mom at age 89 is that she continues to have new friends in her life. This is from Oprah: Stress feels more manageable when you have good friendships. When women are stressed, their brains release the feel-good hormone oxytocin, which encourages them to bond. (Male brains, on the other hand, are more subject to the effects of the hormones cortisol and adrenaline, which promote the fight-or-flight response.) The female response is much more effective in mitigating stress and may be one reason women tend to outlive men. From Tom Rath's book Vital Friends: The People You Can’t Afford To Live Without- "If you ask people why they became homeless, why their marriage failed or why they overeat, they often say it is because of the poor quality, or nonexistence, of friendships." I think our friendships center our life experiences. Our friendships also help us to feel safer in this crazy, uneasy world we live in. Friendships to me are like wrapping myself in a big cozy sweater. I also think that you need to be your own best friend. No one is going to watch out for us better than ourselves. No one knows us better and is go to take better care of us. When we're our own best friend we can follow our heart and soul's compass and be a good friend to others. Lots more great info from the show if you'd like to listen here. Great stuff, Louise! I'm glad you're my friend. You were wonderful on Cindy's show! Your voice was so calming! Great studio pic of all of you! I love what you and your friend share with "the dump" idea. How releasing and healing for both of you! But true friendship is divinely sent and remains eternally in our hearts. Much Love and Blessings to you Louise! Lovely post Louise, thanks for sharing. I am so glad the weekend was a huge success and delighted for the three of you to have shared the time. Here's to continued friendship!! Oh thank you sweet friends. I am so glad you are all my friends too. Nancy so sorry to miss you. Oh, Louise. You are just pure awesome sauce. This was fabulous!